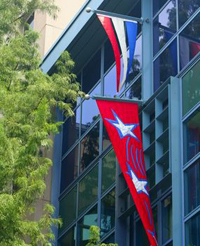 Dress up your business, apartment complex or car lot with color pennants. Shimmering in the sunlight and rippling in the breeze, pennants naturally attract the attention of people in a fun and lively way. We can create pennants in a variety of shapes, sizes, colors and prints. So if you’re looking for a cost-effective and colorful way to advertise your business, give us a call today. We’ve got just the thing.